PATH Intl. is creating a planned giving society, and we need a name. This group includes those who have included PATH Intl. in their will, IRA, life insurance or other long-term plans. If you have an idea for a name for this group, please send it to Megan Ferry. The winner will receive a PATH Intl. logo vest! If you have questions about including PATH Intl. in your will, please email Megan or call her at (303) 452-1212, ext. 107. Thank you in advance for your creativity! PATH Intl. relies on your donations to underwrite the costs of center accreditation and professional certification. By giving today, you help PATH Intl. 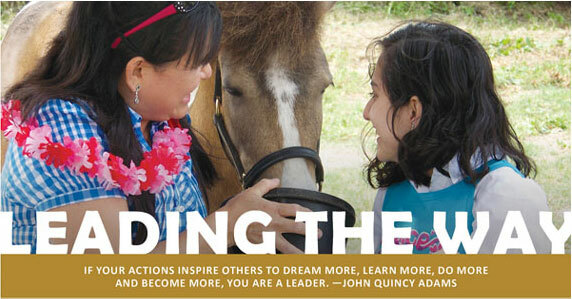 train the therapeutic horsemanship leaders of tomorrow! Video Campaign Benefits PATH Intl. 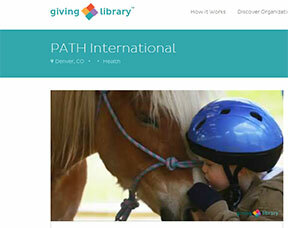 The Giving Library's "Share to Give" campaign is a way for you to support PATH Intl. without spending any money this holiday season. All you have to do is share the PATH Intl. Giving Library video on Facebook or Twitter, and the Giving Library will donate $5 to us. It's that simple! Meet Kara Barten, the newest Member Services Representative at PATH Intl. She will be handling all of the individual/instructor memberships, merchandise and administrative support. Kara moved from Iowa to Colorado last year after graduating from the University of Iowa ("GO HAWKEYES! "), and she has been loving all that Denver has to offer. In her spare time (we will make sure she doesn't have much! ), she enjoys keeping busy outside (hiking, camping, skiing), finding live music around town, and catching up with family back home. "I am very excited to be working with the great staff at PATH Intl.," she says, "and I will hopefully get a chance to meet some of you!" Gift Ideas That Benefit PATH Intl. Need a last-minute gift for the western wear lover in your life? Shop Rods Western Palace and support PATH Intl. while you shop. Thank you! Whether you are looking for articles on innovative programs, inspiring stories, news about PATH Intl. or encouragement from other centers, you can find it in PATH Intl. Strides, and it is online. Log in to the PATH Intl. website on the My PATH Intl. Membership page and scroll down. 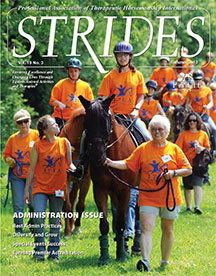 There members can access the most recent issue of Strides. Click here to access earlier issues of Strides, which are available to anyone. There are many benefits to accessing Strides online. If an advertiser has placed its website or email address in the ad, those addresses are linked. This gives you the ease of accessing the advertisers without leaving your laptop or mobile device. The table of contents is linked, allowing you to easily turn to the story you are interested in reading. PATH Intl. Strides is a great member benefit. With online accessibility, this benefit is even better. Are you a member of the military or a civilian working for the U.S. federal government? Do you have friends or family who are employed by the U.S. government? If so, you can support PATH Intl. through the Combined Federal Campaign this fall. The PATH Intl. CFC# is 23051. Thank you for your service to our country! The EQUUS Foundation is pleased to announce the PATH Intl. Champion of Equine Service Certification Scholarship to financially assist prospective instructors who achieve champion status to obtain a PATH Intl. Registered Instructor Certification. The EQUUS Foundation will award one scholarship to cover the registration fee up to $1,000 for the recipient to attend a PATH Intl. Registered Instructor Certification Workshop. In order to apply for this scholarship in 2014, all 24 volunteer hours must be logged in by December 31, 2013. 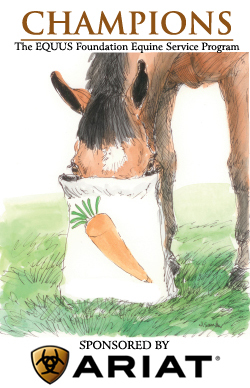 See www.equusfoundation.org for more information. PATH Intl. will continue an innovative partnership with the American Paint Horse Foundation designed to help train therapeutic riding instructors. This alliance provides scholarship assistance to potential PATH Intl. instructors. To apply for an American Paint Horse Foundation PATH Intl. scholarship, email Jan Anderson or call her at (817) 222-6414. Applications should be postmarked by March 1, 2014. Scholarship recipients will be notified by April 15, 2014.